Is your dog insecure? Your dog may be acting strangely and you don’t know why. We will give you some of the signs of an insecure dog so you can judge for yourself. If you can determine you have an insecure dog on your hands, we give you some advice on how to make your dog feel more secure. There are a number of insecure dog behaviors you can look out for if you think your dog may have an issue. Cowering under beds or behind furniture. Crouching in a corner or hiding by itself is a sure sign of insecurity in dogs. Lowering their body close to the ground is a dog’s way of trying to make themselves smaller. Snapping or snarling for no particular reason. An insecure dog will be quick to bare its teeth and lash out. A dog will get defensive if you try to approach it when it feels insecure. If your dog feels threatened it will try to protect itself. Signs of submissive behavior, with its head hanging low, or its tail tucked between its legs, can indicate insecurity. Yawning in dogs can be a sign that they are stressed about something in their environment. Panting can be a sign of anxiety or excitement about something going on around them. Frequent urination can be a sign of stress or fear. Signs of aggression or bullying. Dogs can react to insecurity and stress by becoming more aggressive than usual with people or other dogs. Separation anxiety. An insecure dog will most likely suffer from separation anxiety when you are not around. Why is My Dog Insecure? A dog can be insecure and shy for a number of reasons. They could be shy around other dogs or animals, or around people. They could be uncomfortable in certain environments, like walking near roads or large groups of people. A dog’s insecurity can stem from their upbringing, and how they were treated by previous owners or other animals. This can lead to a number of issues. When you notice your dog is behaving in an insecure way, try to pay attention to what may be triggering the behavior. Insecure dogs are usually lacking in self-confidence for one of the following reasons. Unfamiliar with their environment. Your dog may not feel safe in the environment they are in. This could be your house or yard, or when you are out and about with your pup. If your dog has not been exposed to new environments early in life, they may feel insecure when something new comes up. Lacking owner’s guidance and leadership. Being your dog’s pack leader is a great way to make them feel safe and looked after. If you are not guiding and protecting your dog properly they may feel insecure. Emotional instability. Your dog could have mental or emotional problems like anxiety or depression resulting from changes in their routine or environment. Any changes in the people around them, like a new baby, or a family member suddenly leaving, can affect a dog’s mental stability. Trauma. Dogs who are victims of abuse and or neglect can also develop insecurity. Trauma often leads to fear and suspicion which will make many dogs shy and insecure. Injury or illness. If your dog is sick or injured it can make them a bit unsure of themselves and lead to them being shy or insecure. Genetically predisposed. Some dog breeds are known to be shy, reserved, quiet, or introverted. Helping to make an insecure dog feel secure is all about building their confidence. Here are a few things to remember when trying to help your pup shed some insecurity. Time and patience. You often won’t be able to fix an insecure dog in one session. If you are impatient you can force your dog into a situation that may feed their insecurity. Just like with any kind of dog training, you will need to give your dog time to learn what you are trying to teach them. You will need to slowly work through your dog’s issue. Expose your dog to his fears. Once you know what your dog is afraid of, you should not avoid it. Helping your dog work through his fears helps build confidence. This will translate to other fears or insecurities your dog has as well. You should do this gradually and carefully. Be mindful of pushing too far too fast. Pushing your dog into his fears will be counter productive. Socialization is an important step towards helping your dog feel more secure around other dogs and people. Starting early is important, but it is just as important to continue to introduce your dog to other dogs and people regularly. When your dog feels insecure around others you need to take this step slowly and gradually. Do it in a familiar environment where your dog already feels safe. Avoid big groups of dogs or people to start with. Think calm and relaxed social interactions. Keep your dog physically and mentally stimulated. Physical exercise will help to keep your dog happily worn out at the end of the day. Mental stimulation will help to keep your dog’s mind off any fears or insecurities. Take your dog walking every day to get out into new environments. Massage can help calm your dog. Dog’s respond well to a relaxing massage and it can help keep them calm and stress-free. Avoid being overprotective. Indulging your dog’s fear or insecurity is not going to help him become more confident when facing the same situation in the future. Avoid hugging or coddling your dog. They will see this as a reward. Ignore your dog when showing signs of insecurity and praise him when showing signs of confidence. Be consistent with your behavior and commands. Avoid punishing your dog for their insecurity or any resulting bad behavior. Remember to reward good behavior and ignore bad behavior. Watch your emotions around your dog, they can pick up what you are feeling. You need to be calm and confident. Lead the way. Make yourself the pack leader. Show your dog that they are being looked after and protected. This is so that they don’t have to make any decisions. Avoid being overly assertive as this can cause more insecurity. Try to put yourself on their level instead of standing over them. Avoid too much direct eye contact. Act confident and your dog will pick up on it. Your confidence will help to improve their confidence. One of our favorite resources for training insecure dogs is Dan The Online Dog Trainer. 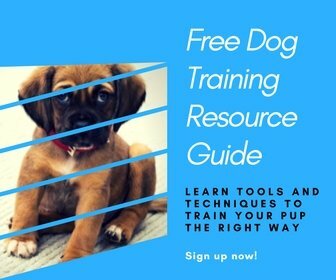 He has a great video series and online community that teaches you how to be your dog’s pack leader, and how to build your dog’s confidence. If your dog’s insecurity is showing as stress or anxiety there are a few different products you can try to help calm them down. The ThunderShirt Dog Anxiety Jacket wraps around your dog to apply a gentle, constant pressure. This can help to calm anxiety, fear, and over excitement in dogs and helps to calm them during fireworks, thunder, separation, travel, and vet visits. This Snuggle Puppy Behavioral Aid Toy provides warmth, physical contact, and a soothing heartbeat to help relieve your dog’s stress and anxiety. These dog chews include a calming formula for dogs exposed to increased environmental stressors. They can help to alleviate stress-related behavior problems like nervousness, hyperactivity, and anxiety and help keep your dog calm and relaxed. Insecure dog training can be a bit of a challenge because your dog is lacking the confidence he needs to try something new. But your persistence will pay off and it will actually help your dog become more confident. Start with some basic obedience training. Learning new skills will help build your dog’s confidence. Once your dog has the basics down then move on to more advanced tricks or agility training. Introduce new environments into your dog’s life. Take him to new and different places and let him explore them at his own pace. This will help your dog build confidence. Keeping your dog restricted to the same environment can be isolating and can create insecurity when anything changes. Build your dog’s confidence. When training, reinforce good behavior with praise and treats. Repetition builds confidence. Use every available opportunity to provide your dog with positive reinforcement. Think how you feel when someone praises you for doing a good job. It gives you more confidence. Your dog will feel the same. Every day try to look for opportunities to give your dog some praise for something he does, particularly if it something that takes courage. If you think that your dog’s insecurity stems from a more serious issue, or that it may be something that you cannot fix then you should seek professional help from a vet or dog behavioral specialist. All dogs will show some signs of shyness or insecurity at some point. Your job is to guide them through it and help them regain their confidence. Do this well and your dog will be happy and healthy. P.S. Help a friend with their insecure dog by pinning this! Dachshund Dogs: 10 Things You Didn’t Know!